MURRELLS INLET, SC (WMBF) - Adam Levine and Blake Shelton are known for feuding and disagreeing on NBC’s “The Voice.” But there’s no way those two can disagree, the members of their teams from the Grand Strand put on quite a show for a packed Bubba’s Love Shak Friday night. Cecily Hennigan, 16, was in the crowd watching Jimmy Mowery, 31, perform wearing her “Team Blake” jacket. Adoring fans recognized her from the show and asked her for pictures. Hennigan looked right at home in the spotlight. The Conway High School student picked up the guitar, and the pair ended up performing two songs together: Lady Gaga’s “Shallow” and “Closer” by the Chainsmokers. 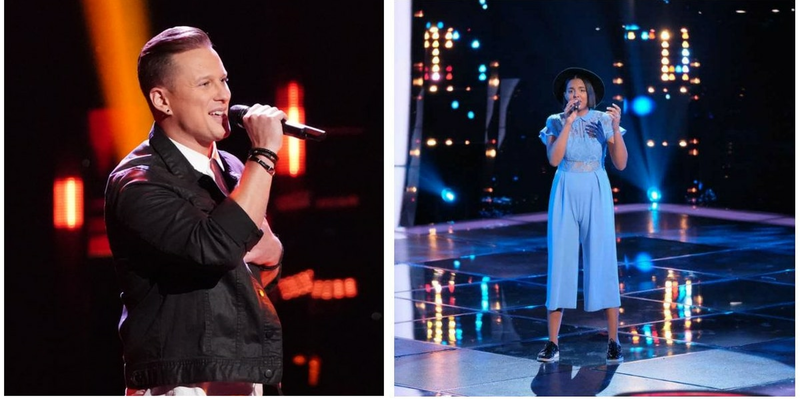 Though Shelton was the only judge to turn around, John Legend told Hennigan her voice was developed beyond her years, Levine said she was awesome and Kelly Clarkson said her song choice was rad. This isn’t the first time Hennigan has found herself in the spotlight. In August, she belted out her order at a McDonald’s drive-thru while her friend provided a beat. It was all caught on camera and currently has over two million views on Facebook. The viral video garnered national attention including an appearance on The Steve Harvey Show and a feature as Hoda Kotb’s “Morning Boost” on the TODAY Show. Kotb featured Hennigan again this week after she landed a spot on Team Blake. Jimmy Mowery, 31, appeared earlier in the season, earning chair turns from both Levine and John Legend for his performance of “Attention” by Charlie Puth. Mowery currently lives in Myrtle Beach, but was born in Altoona, Pennsylvania. He performs across the Grand Strand. WMBF News reporter Amy Kawata caught up with Mowery before his March 8 performance in North Myrtle Beach. You can watch that interview here. WMBF News Today anchor Audrey Biesk will also feature Hennigan in her “Student Spotlight” segment Monday March 25 on WMBF News at 4 and WMBF News at 7 before The Battle Rounds begin on “The Voice” at 8:00 p.m. on WMBF News.